It's time for Sunday Supper! This week I'm in sunny (and hot) Orlando, Florida for Food Wine Conference. This weekend has been so uplifting and eye-opening. It's like a family reunion here, seeing old friends and connecting with new bloggers. 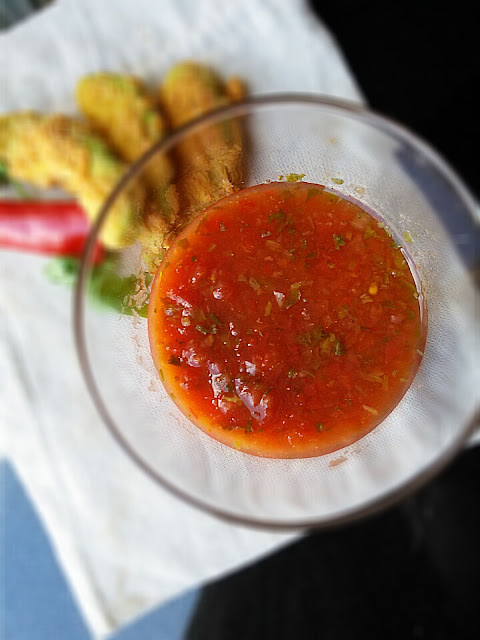 This gazpacho is an old friend that I've updated to make new. This week's theme is tapas and I'm attending a live Sunday Supper event at Tapa Toro in Orlando which is a Spanish tapas restaurant. My favorite seasonal Spanish dish is gazpacho, so why not? Gazpacho has become one of my signature dishes, I think. I make it multiple times each summer to rave reviews from everyone who has had the opportunity to sample it. I first made it for the public, last summer during a $20 Challenge episode. But this version is better. Much better. I've been asked if it can be heated to make a hot soup. Of course it can, but I don't recommend it. The subtle fresh flavors of the tomatoes and cucumber will probably be ruined by the heat. 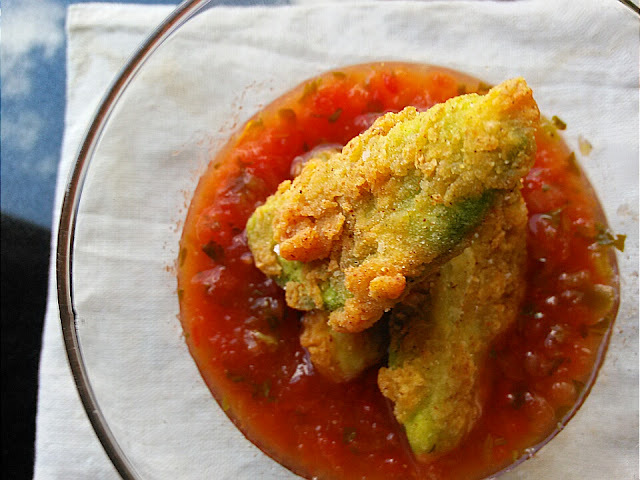 If you want some heat, make some fried avocado bites! The star of the show is simple: cool, creamy center paired with the hot, crispy exterior is the perfect foil to the chilled soup. I've recently discovered that I'm allergic to avocado so even though I can't indulge, it's good to know that you can. And yes, Virginia, there are many health benefits to avocados too and if you didn't know, there are THIRTEEN right HERE! Don't forget to scroll to the bottom of the post to check out the rest of my Sunday Supper family and see what tapas-inspired dishes they have shared. 1. Combine tomatoes, cucumber, garlic, vinegar and bread in a blender or food processor until blended and thoroughly mixed. 2. Sprinkle in granulated sugar, season with salt and pepper and with the processor running, slowly pour in the extra-virgin olive oil. 3. Taste and season accordingly. In a medium bowl, combine buttermilk, hot sauce and avocado slices. Soak for 30 minutes. In a medium Dutch oven or deep-fryer, fill oil to a depth of 3 to 4 inches (no more than halfway up the sides of the pan.) Heat oil to 375 degrees F over medium-high heat. Combine cornmeal, flour, chili powder and salt in a shallow dish. Dredge soaked avocado slices in the cornmeal mixture, shaking to remove excess cornmeal. Place avocado slices in the hot oil and fry until golden, about 1 to 2 minutes each side. Using a slotted spoon, remove slices and drain on a paper towel-lined plate. Season with additional salt. Serve immediately with a squeeze of fresh lime. 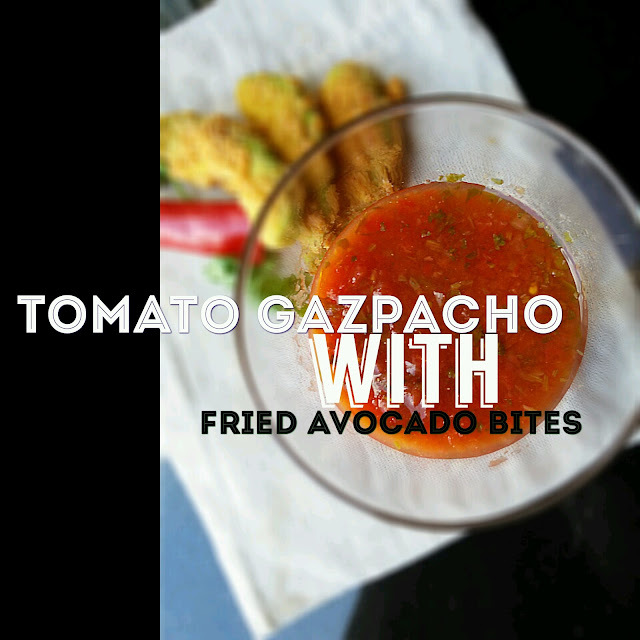 I NEED to make the fried avocado. I want to eat that every day of my life. YUM!!!! Yum! I can't wait to try your renowned gazpazcho! Yum! This sounds like an amazing combination. I'll definitely have to try.